It’s a big week in the enterprise communications and collaboration world with Enterprise Connect happening over in Florida – the big annual show where all the industry players present their impact in the market and their vision for a new way of working. Microsoft have come out swinging on day one with some big announcements to coincide with the 1st anniversary of Microsoft Teams. Let’s get straight in and talk about what these new features mean to you. This is really where the intelligent part of Microsoft’s vision for communications comes to life. How many times have you spent the first 10 min of a meeting trying to get the sound or camera to work in the room? That’ll be a thing of the past, because soon you’ll be able to ask Cortana to join your meeting for you and it’ll all just work. This is in my view, the biggest game changer for users. No longer will you need to record a meeting on your laptop and upload the video file to SharePoint. With cloud recording you’ll be able to capture everything happening in the meeting and share it straight to Microsoft Stream with those that couldn’t join. Working on a multilingual team? Teams will now translate messages in a channel on the fly. Then there’s other neat features like blurring your background on video calls so people don’t see your washing drying on the clotheshorse behind you – true story! Meetings happen in rooms. A lot. So that’s why we need to consider how everyone from a huddle of 2-3 people to a 10 person board are going to join a Teams meeting smoothly with remote participants. Fortunately there’s a plethora of options coming to achieve this, with native Teams meeting support on Surface Hub, interoperability with other video systems (so your Cisco devices can join Teams meetings), new devices from Lenovo, HP and Yealink and existing Skype IP phone/conference room support for Teams coming. This means whether you want to use what you have today or deck out rooms with something new, you’ll be covered. From a voice/telephony perspective, this will open up loads of potential ways to create a consolidated way of communicating. If porting your phone numbers to Office 365 isn’t a fit for you (e.g. you want to run a pilot or migrate batch by batch, you have a long term contract with your carrier, etc), Direct Routing allows you to plumb Teams into a certified session border controller and into your existing SIP trunk, PABX or ISDN circuit and light up voice in the cloud on your terms. This entry was posted in Microsoft Teams, Office 365 on March 13, 2018 by Justin Morris. Thought I’d share a recent experience that I feel is indicative of the market acceptance of Microsoft Teams and the direction it’s going, especially if you’re new to Office 365. Recently I’ve been advising a niche investment management firm on their journey to Microsoft cloud communications – consulting on business value, ROI and roll-out costs with their CTO and exploring meeting room solutions as an initial step towards value. Our plan was anchored in replacing the hosted VoIP system with Office 365 Phone System and Skype for Business Online. In parallel, the internal IT team were enabling Office 365 for the first time for analysts, advisers and managers. Then an interesting thing happened. As the roll-out of Office 365 has been gaining momentum with the migration of email, a subset of executives have discovered Microsoft Teams and started trying it out. This initial dip of the toe in the water has led to Teams being used for their board meetings, which I’m really impressed by. In addition, previously an all-hands call would be run at the start of the week with files shared over email and a PSTN dial-in conference setup. Since the advent of Teams, that event has moved to a dedicated Teams channel where relevant files and notes are shared with attendees and an audio/video meeting runs when the call is scheduled. Truly a great example of rapid innovation on the platform driven by the business. This firm still have some life left in their hosted VoIP solution (it’s not up for renewal or causing any business problems), so it’s likely they’ll put their Skype deployment on hold and wait until the voice features in Microsoft Teams mature later this year, then roll Teams out off the back of the success in the business already. A smart move to leverage goodwill, quick wins and confidence in the tech. Microsoft Teams has been a quantum leap for them culturally and they’ve embraced it completely. It’s really interesting and positive to see the value Teams is bringing for organisations brand new to Office 365 in different industries and how simple it is for people to start using it. This entry was posted in Microsoft Teams, Office 365, Voice Integration on March 5, 2018 by Justin Morris. If you’ve been observing coverage of Office 365 in the media and on Twitter in the last few days, you’ll have noticed that Microsoft appear to be preparing to rename Skype for Business Online Cloud PBX to “Microsoft’s Phone System” and PSTN Calling to “Calling Plan” based on details of a Microsoft Ignite 2017 session to be delivered by super-smart UC industry stalwart Albert Kooiman. Another indication of how the broader messaging may be changing to Real-time Communications can be observed in another session described as “introducing our newly created Networking Portal – an essential piece of Planning and Operating any Real Time Communications environment, whether running Teams, Skype for Business or both”. A lot of the speculation and commentary around this so far has been mixed, but I personally think this is a great move by Microsoft. Focusing on clear business terms supports Microsoft’s modern workplace solution area, which will deliver the Empower Your Employees digital transformation outcome. In my view, it breaks down like this: Digital transformation -> Empower your Employees –> Modern Workplace –> Real-time Communications. When Microsoft launched Teams in November 2016, Satya Nadella called Office 365 “the universal toolkit” with Teams providing a chat-based workspace alongside SharePoint, Yammer, Skype for Business and Office 365 Groups. The features Microsoft Teams and Skype for Business provide (chat, calling, meetings, document sharing, etc) are becoming the real-time communications surfaces of the Office 365 universal toolkit. Office 365 is now a portfolio of complimentary capabilities an employee can utilise depending on who they work with and how they need to work. I believe it’s far clearer for a broad audience with no PBX, UC or technical background to understand these capabilities as part of the Office 365 universal toolkit, rather than trying to work out each disparate product silo. The future of real-time communications in Office 365 is fuelled by Skype for Business and Microsoft Teams; and each will have their strengths depending on what someone needs to achieve. Whether someone uses one or the other will depend on how they need to communicate and with who e.g. an individual, a defined functional department, a short-term project team, etc. This entry was posted in Office 365 on August 9, 2017 by Justin Morris. I get that for some organisations there are certain security and governance reasons why email stays on-premises (they’re using a specific product for secure mobile access, legacy archiving or document management, etc), but I really think the majority of organisations could eliminate a ton of headaches and unlock flexibility by just putting their email in the cloud already. Here’s my view on why. Skype for Business Online does work with Exchange Server on-premises, but it’s not without issues. Gremlins in your legacy Exchange environment can cause complications with authentication such as being prompted for credentials after sign-in, playing havoc with your Skype for Business experience. Are you thinking about Cloud PBX? If you’re looking at getting rid of your old PABX for the new Cloud PBX voice features in Office 365, you should really have your email in Exchange Online to use the automatically enabled voicemail features. Exchange Server 2013 CU12 is supported, but I’m finding a lot of companies that are a few CU’s behind, so it makes more sense just to move to Office 365. The rich experience you get in Office 365 Groups, Teams, Planner, Delve, MyAnalytics and SharePoint when mailboxes are in Exchange Online sends productivity into overdrive. Not to mention that you never have to upgrade or patch your email systems anymore, meaning when Microsoft add a new feature to Outlook Web App, you see it straight away and don’t have to submit an RFC to the CAB to patch your 15 Exchange servers. Evergreen service, low overhead, what’s not to love? I’ve seen IT teams in modern companies go from looking at Solarwinds dashboards every 10 minutes to make sure the mail queue doesn’t go red (“let me just log into Gmail and send a test message to my work account… ok we’re good”), to thinking longer term about how IT can benefit the business, and that I feel is a huge career enabler. I know I’m likely preaching to the choir here, but if your email is still on-premises, I’m genuinely intrigued to know what’s stopping you from moving it to the cloud. This entry was posted in Office 365 on December 29, 2016 by Justin Morris. After 6+ months of availability, I want to share what Modality are seeing in the APAC market and dispel some of the myths and hearsay around what is and isn’t available in Skype for Business Online in APAC right now. A lot of people I speak to say “yes but Cloud PBX isn’t in Australia/Singapore/other APAC country yet” – which isn’t quite true. We have customers deploying Cloud PBX in Singapore and Australia right now. In this post, I’ll talk about how you can deploy and what the considerations are. Cloud PBX is the product name for Skype for Business calling features in Office 365 e.g. make/receive calls, hold/transfer/send to voicemail, team-call groups, music on hold etc – full list of features here. Don’t think about it in the context of how calls are made to/from the PSTN. PSTN calling isn’t available just yet in APAC. This is what most of the market considers “Cloud PBX in Office 365”. It means Microsoft providing your connectivity to the PSTN, porting your existing phone numbers/buying new ones directly from Microsoft and having no on-premises infrastructure. It’s available in the US and in the UK in preview right now. Your ability to buy PSTN calling is defined by where you pay for Office 365 and where you tenant – your “sell-to country”. As more countries are enabled for PSTN calling, your tenant will get access to numbers in those countries. E.g if you pay for O365 in the US, once PSTN calling in the UK reaches general availability, you’ll be able to assign UK numbers to users straight away. We’ve been trialling this with our US tenant in Modality since it was released and the ability to give new staff a phone number in the state they live in instantly makes on-boarding so simple. What can I do without PSTN calling? Just because PSTN calling isn’t available in APAC doesn’t stop you from deploying Cloud PBX. Using your existing on-premises PSTN connectivity with Cloud PBX allows you to start using those features now rather than having to wait until general availability is announced. To do this, you can deploy Cloud Connector Edition (CCE) in your DMZ and connect it to the ISDN or SIP trunk service from your current carrier. Alternatively you can setup a hybrid environment with your existing Skype for Business Server deployment and Office 365. Plugging Cloud PBX into your ISDN/SIP service means users keep their phone numbers in the cloud and teams/offices can be migrated at their own pace. It also allows your to maintain a period of coexistence with the current phone system if a big-bang approach isn’t your cup of tea. Real world reference – two of our customers are centralising their Australian PSTN connectivity with SIP trunks in two data centres on the eastern seaboard and then migrating each capital city office to Cloud PBX as they roll out Office 365 Pro Plus. Think about what your staff have today and what they’ll need tomorrow. Most of our customers keep a few phones on desks but deploy a majority of headsets along with Skype meeting room devices. Consider components like reception consoles, hunt group wallboards/reporting, fax machines, UPS/security modems, contact centres and call recording requirements. If you have some of these requirements, a hybrid approach might be right for you. Think about where your organisation is going – are your teams crying out for ways to be better connected anywhere and on any device? A common request we hear is staff don’t want to be chained to their desk to make calls to customers and partners. Get people excited by showing them how easy it is to use a Bluetooth headset with Skype for Business on your PC and on your mobile to join meetings and make calls. Once you decide on the features and functionality, determine the right approach and architecture for roll out. Where are your current ISDN/SIP services terminating and where is your DMZ? Are your mailboxes already in Exchange Online? The answers to these questions will help define your timeline and architecture for Cloud PBX. Cloud Connector Edition (CCE) gives you a lightweight way of bringing Office 365 on-premises to connect to the PSTN, and it’s the path we’re seeing most customers already using Office 365 take to deploy Cloud PBX now. Organisations across APAC are embracing Cloud PBX as part of their Office 365 strategy. They’re getting away from crumbling phone systems (a common email I get is “the phone system went down again, how soon can we get on Cloud PBX?”) and allowing their staff to communicate from anywhere, anytime and collaborate on any device they have. This entry was posted in Office 365 on June 26, 2016 by Justin Morris. With the continuing juggernaut of Microsoft UC (Lync or Skype for Business, depending on where in the journey you’re at) adoption in the market, I never stop discovering new approaches to get users using things faster – be that from our own internal thinking, customer ideas or feedback from users. Recently I’ve seen a few user scenarios that call for balance. That there is a valid reason to accommodate some of the status quo when it comes to UC adoption, but also ongoing value to push forward with a new way of working. This entry was posted in Uncategorized on October 17, 2015 by Justin Morris. I first published this post over on LinkedIn. The launch of Skype for Business is the last piece in the puzzle that will have users excited about Microsoft’s enterprise communications software. It’s going to change the conversation from “well, it’s this app that integrates with Office and you can use it to chat and make phone calls” to a simple statement of “you know Skype? It’s that, but for business”. This entry was posted in Industry on April 9, 2015 by Justin Morris. During a recent Lync 2013 Enterprise Voice roll-out I was configuring interoperability with the legacy Nortel CS1000 PBX. For this, we’d deployed a pair of Sonus SBC 1000 gateways with 2x ISDN PRI ports each. In each gateway, one PRI port was connected to the PSTN and the other PRI port was connected to the CS1000, so these gateways were deployed in an upstream model in front of the PBX. This entry was posted in Coexistence/Interoperability, Migration, Voice Integration on September 23, 2014 by Justin Morris. 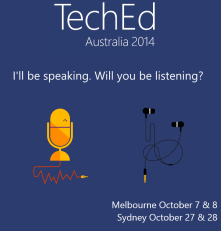 Having moved back to Australia 2 months ago, I’m stoked to announce that I’ll be presenting at TechEd Australia next month in Melbourne on October 7th/8th and Sydney on October 27th/28th! I’ll be presenting 10 keys to ensuring the success of your Lync deployment in the Office Servers and Services track where I’ll cover the important technical and business considerations you need to watch out for to ensure users love their new communications solution. Make sure you also check out Microsoft’s Vakhtang Assatrian’s session on Addressing Lync 2013 Security Aspects. I’m looking forward to seeing folks interested in Lync from all over Australia, look forward to seeing you in Melbourne and Sydney next month! This entry was posted in Events on September 14, 2014 by Justin Morris.